Gilitickets.com offers a no frills online ticketing service for some of the cheapest fast boats from Bali to Lombok and the Gili Islands. Our fast boat partners maintain the seat availablity on this website. Just use the search box above to see what is available, book, pay and receive your e-tickets. All tickets are fully refundable up to 2 weeks from travel, and we offer free dates changes more than 48 hours from departure. Gilitickets is a unique 'no frills' online booking system where you can check live seat availability, make immediate confirmed online bookings, and receive cheap tickets straight away for some of the best of budget fast boats from Bali to Lembongan, Bali to Lombok and from Bali to the Gili Islands. Simply use the search box at the top of this page to see which fast boats have seats available and book. You can check all the different routes between Bali and the Gili Islands, schedules, boat photos, specifications and safety equipment. Each fast boat company on our website maintains the live seat availability, this functionality is unique to only 2 websites for booking fast boat tickets to the Gili Islands, us and www.gilibookings.com. Our travel tips are provided by our sister company www.gilibookings.com who work together with the most reputable fast boat companies servicing the Gili Islands and offer a complete service including discounted activites, full customer service and are recommended by The Lonely Planet for making fast boat bookings from Bali to Gili online. Whereas Gilitickets is purely a portal to compare fast boat ticket prices and information for the best of the cheaper fast boat companies. Fast boat ticket payment on Gilitickets can be made using your credit card or your PayPal account through PayPal's secure payment system. TIP: Check out our How to Book page to get quick answers to the most common questions about getting from Bali to Lombok, Lembongan and the Gili Islands. For more information and photos of our fast boat partners view their summary pages; Eka Jaya, Patagonia Xpress, Kuda Hitam, Wahana, Mahi Mahi, Semaya One, Pacha Express, D'Camel and Rocky Fast Cruises. Since the first fast boat started operating from Bali to the Gili Islands in 2006 there has been an explosion of fast boat companies starting up and there are now boats departing daily from a variety of places in Bali. Most boats depart from Padang Bai and offer a free hotel transfer service from most areas in South west Bali, Ubud, and areas close to Padang Bai. 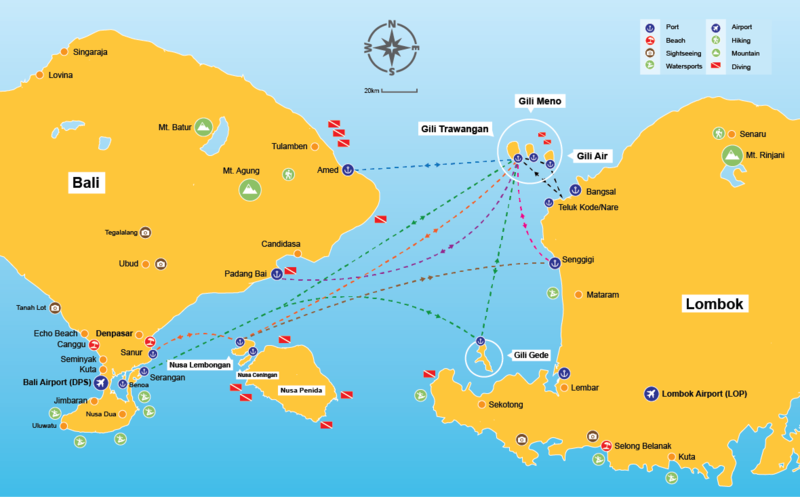 Other boats depart from Serangan harbour in South West Bali and Amed in north east. All of the fast boats stop in Lombok on the way to Gili Trawangan and some of them also go to Gili Air. Most of the fast boats operating are small high speed craft that seat from 30 to 100 passengers. The standard of the crews training, the general service and the safety equipment are of a very mixed standard and some of the services may be well below the normal expectations of many foreigners. Gilitickets does not hold any responsibility for the level of service, quality of boats or travel arrangements offered by the boat companies that sell their tickets on our website. We have simply selected the most popular boats and made sure that all routes are covered. For the highest quality fast boat and ferry services in the region please use www.gilibookings.com instead.